Can you believe MUD BASH is NEXT WEEK?!?! We just wanted to remind everyone of a couple things and give you a list of all the events going on! 1. PLEASE HAVE YOUR WAIVER CARDS READY WHEN CHECKING IN!!! If you do not have a card with your picture on it, PLEASE print out the waiver form, have it filled out and ready to give when you are checking in!! If you have a waiver card and can not find it, PLEASE print out another waiver form and have it filled out!! This helps tremendously when checking in!! 2. Pricing: Any day prior to Friday is normal pricing ($5 per person per day, $10 per ATV per day, $5 per person to tent camp per night or guest at RV spot. 30amp w/e or elect only $20 per night, 30amp full $25 per night, 50amp full $35 per night). Starting Friday pricing increases to $10 per person per day, $10 per ATV per day, $10 per person to tent camp per night or guest at RV spot. 30amp w/e or elect only $25 per night, 30amp full $30 per night, 50amp full $40 per night.) RV HOOKUPS include 2 peoples NIGHT FEES ONLY! Any additional people will pay tent camping price each night. 3. We have been getting calls about RV spots. All RV spots are already reserved. However, you can still bring your camper and run a generator. We will not run out of room for primitive camping!! I have attached the link to print out the waiver form! 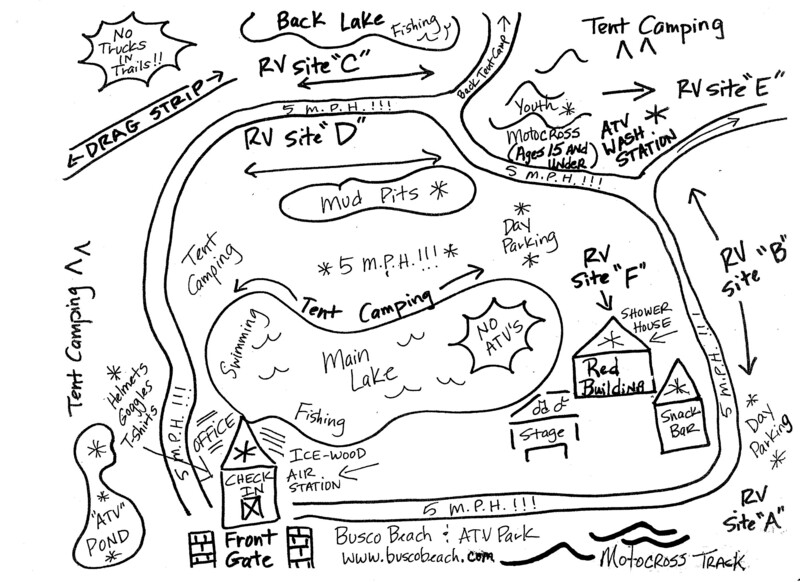 Busco Beach and ATV Park shared a post. Happy Wednesday! Easter weekend is here! Don't forget about the FREE COOKOUT this Friday at 7:00pm at the white building in the field! The Easter egg hunt for children (12 and under) will start at 10:00am on Sunday morning in the vendor field. The adult Easter egg hunt will start at 11:00am. Everyone will meet at the office for instructions on the area the eggs are hidden. There will be 12 eggs total with prizes ranging from $100 to store merchandise!!! Happy Saturday! Easter will be here before you know it! Don't forget about our FREE cookout Friday, April 19 at 7:00 at the white building! Also, we're doing Easter egg hunts for children and adults! Children start at 10:00am and adults start at 11:00am. We are limiting to only 3 RV spots per reservation. Please know what size your camper/enclosed trailer is and what AMP you need before you call. All deposits must me in by May 18 to keep your spot. 1. Please do not rinse off your ATV's at a campsite. There is a FREE wash station for doing that! When you do, it causes a muddy mess that takes longer than it should to fix. Please be mindful of the people that have those spots reserved as they do not want to camp in a muddy camp site! You don't want to miss our first ever sound competition at our 2019 Mud Bash!!! There will be a total of $900 in cash prizes to the winners! Mark your calendars for Friday, May 3 at 3:00pm at the stage area! There will be 3 different classes; ATV, UTV and DB Drag. ATV/UTV classes will be judged off a TermLab Meter. The DB Drag will be the crowd decision! The weather this weekend is suppose to be absolutely gorgeous!! The MX track and drag strip have both been groomed and ready for riding! We can't wait to see everyone!!! Our trail systems are changing daily due to conditions of the land and vary from mud pits, water crossings, hill climbs, and hard packed wood trails. ATVs and motorcycles are welcome, however we do not allow trucks or jeeps on the trails or riding in the rivers.